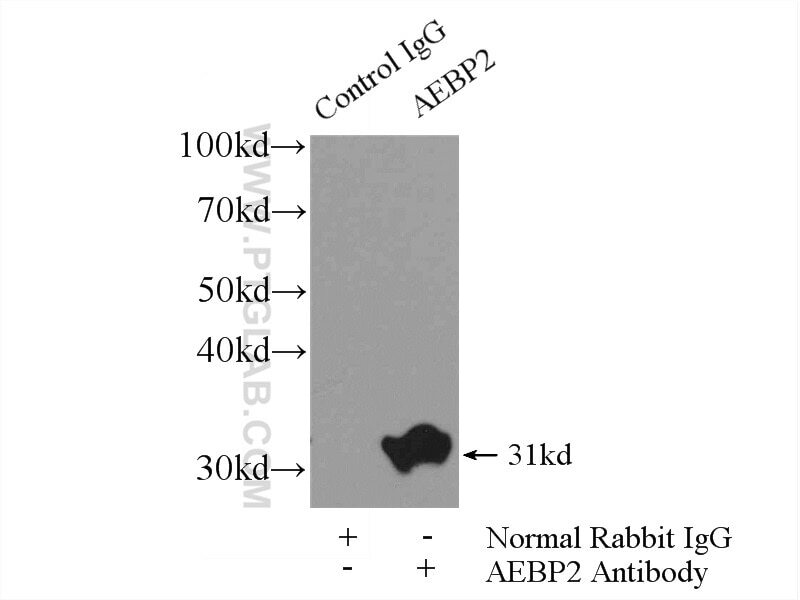 IP Result of anti-AEBP2 (IP:11232-2-AP, 4ug; Detection:11232-2-AP 1:300) with mouse testis tissue lysate 4800ug. AEBP2, also named as Zinc finger protein AEBP2 or Adipocyte enhancer-binding protein 2, is a 517 amino acid protein, which contains 3 C2H2-type zinc fingers and belongs to the AEBP2/jing C2H2-type zinc-finger family. AEBP2 as a DNA-binding transcriptional repressor may interact with and stimulate the activity of the PRC2 complex, which methylates 'Lys-9' and 'Lys-27' residues of histone H3. It may e playing a role in craniofacial and digital development, as well as development of the central nervous system and gastrointestinal tract. AEBP2 as a potential targeting protein for Polycomb Repression Complex PRC2. Aebp2 as an epigenetic regulator for neural crest cells. Dual functions of Tet1 in transcriptional regulation in mouse embryonic stem cells.